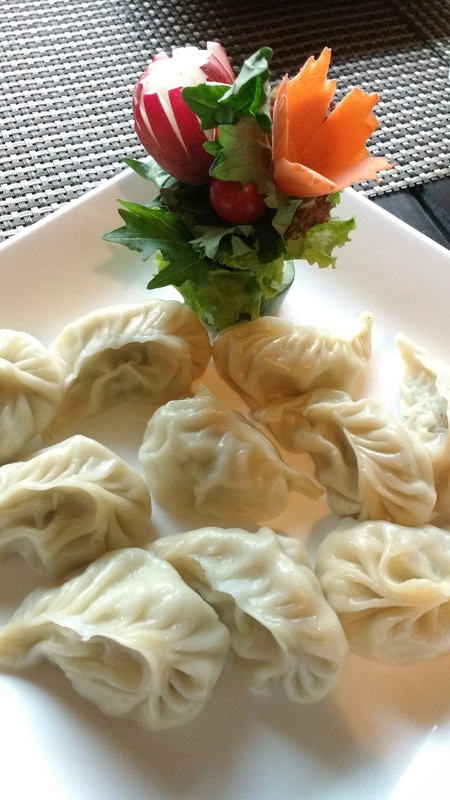 ​Finding a good Thai restaurant in Delhi NCR is a tough job, specially when you are looking for authentic Thai. Specially when it’s Gurgaon you are left with hardly 1-2 options. A friend of mine spotted this restaurant while passing by and convinced me come that far for lunch. Now about the restaurant. A simple yet elegant setup is what the place have, they have a huge open sitting which will be apt for the coming winters. They do have indoor sitting but max they can accommodate is 20 pax. Coming to the food, while in conversation with the manager we came to know that they have a Chef from Thailand who is taking care of the food. No doubt their food is not indianised and very close to authentic Thai. So we started our meal with SEA FOOD SALAD which had a tangy flavour to it. Loaded with Prawns and some greens it was preety good. 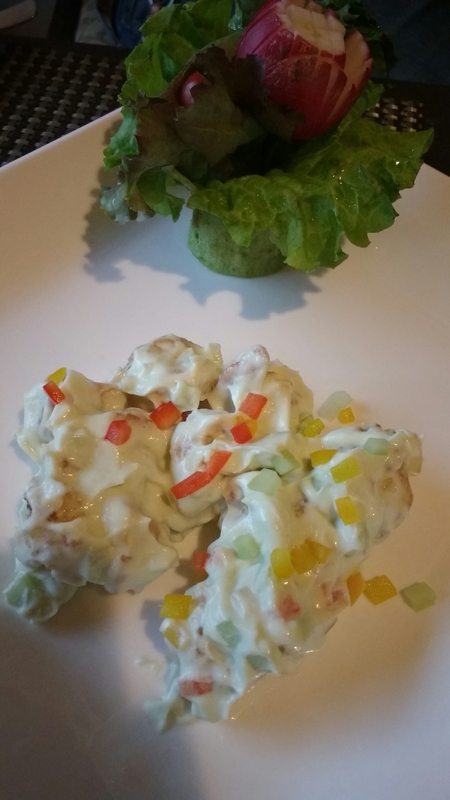 WASABI PRAWNS is a must order dish from their menu, Prawns coated with a dressing that had Wasabi, Bell Pepper and Mayonnaise. I love Prawns and I loved the dish to its core. PRAWN SPRING ROLLS were also good, jumbo Prawns rolled in a Filo sheet and deep fried. CHICKEN NORI a different dish for me, Minced chicken with some herbs is wrapped in a NORI sheet and deep fried. 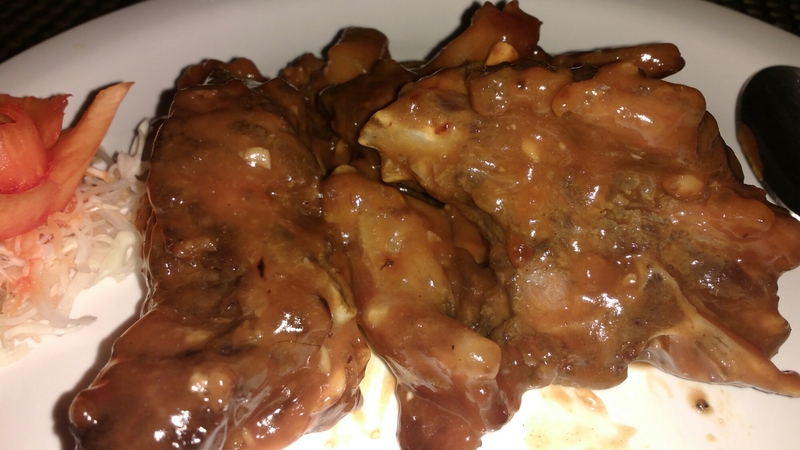 Do try their PORK RIBS as they are awesome, ribs perfectly cooked and tossed in red wine sauce. 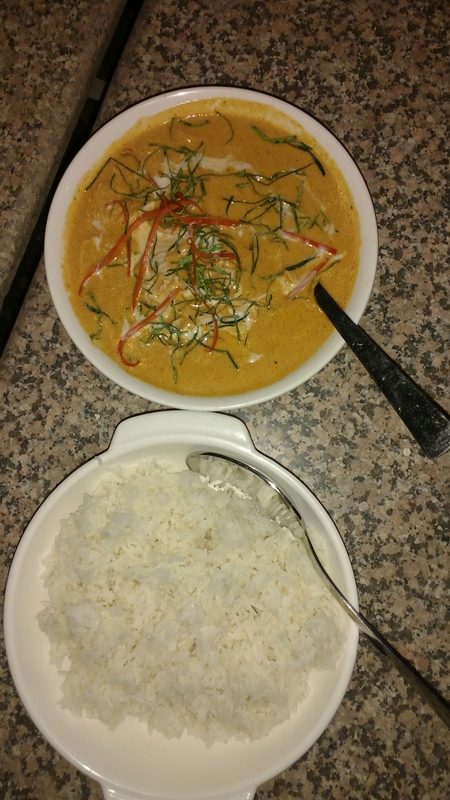 CHICKEN PENANG Curry with STICKY RICE a perfect combo meal. The Curry was mild in spices and went well with Rice. COCONUT FRIED RICE never had something like this the rice had coconut flavour and you can have it solo without any gravy dish. The chef insisted us to try HOT POT as it is their specialty. So the setup is made to sit the pot of Broth on the table and bring it to boil, a strainer like vessel is put upside down in the hot pot. Now you put your fav meat or fish on the strainer and let it steam cook. 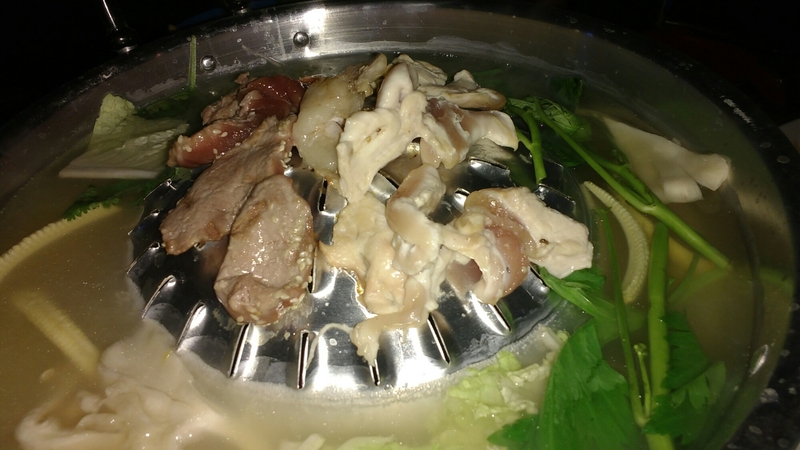 It takes hardly 2-3 MTS for the meat or fish to cook and you can eat straight from the hot pot. It’s just like BBQ but here food is cooked through steam. Something new and interesting. 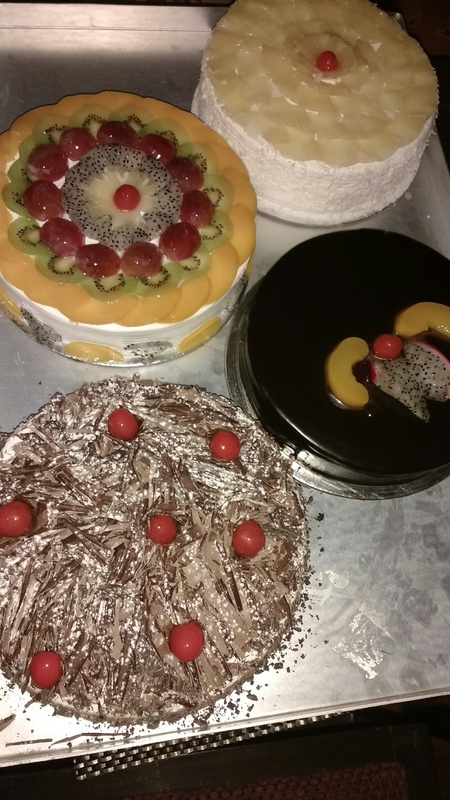 Finally the desserts. As they have a bakery so freshly baked cakes were a choice but as I search for something different and new I opted for Coconut Jelly. 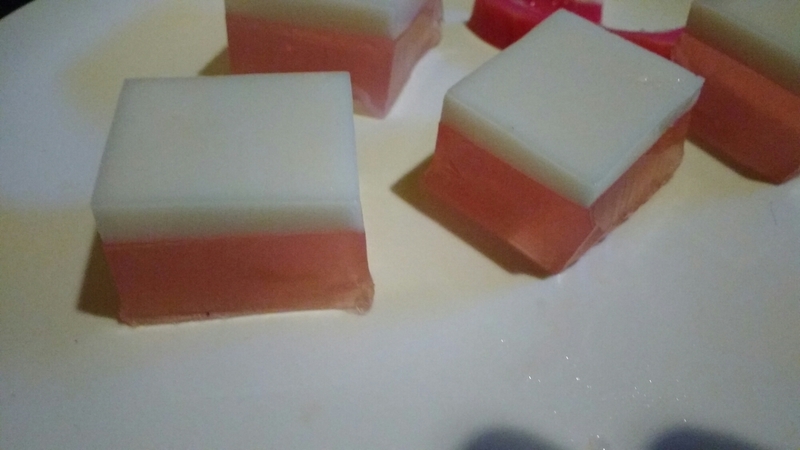 Here the pulp of a tender Coconut and coconut water is turned into a jelly desserts. I simply loved it. Honestly I can have a bowl full of coconut jelly everyday. So this Thai experience was good and traveling that far was worthed. ​Breakfast sometimes is tricky, what to have for the first meal of the day is sometime the biggest question. Sometimes we run out of ideas and places to have good breakfast, as a result we end up having the usuals or sometimes the unhealthy one. 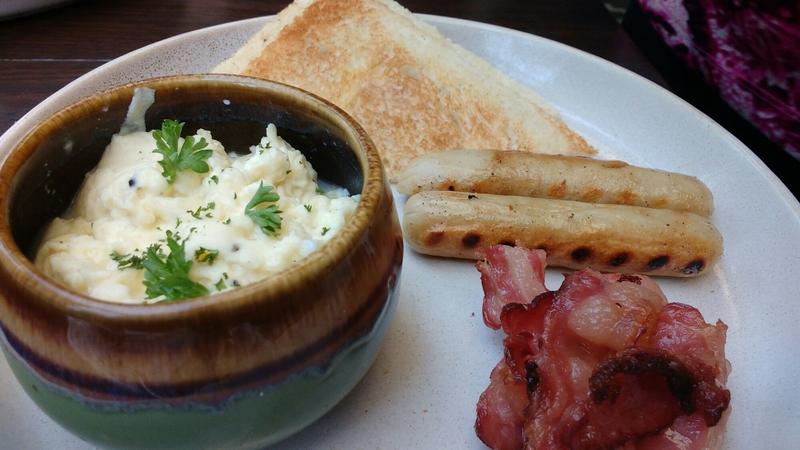 Recently I came to know that The Chatter House have started new Breakfast Menu.The Chatter House is one of those places which is a safe bet whenever a good dine out is needed. The place changes its menu from time to time and includes different dishes for different choices. Talking about their Breakfast menu, it’s a mix bag of different cultures and cuisine. Veg or non veg the breakfast served here is scrumptious. We reached Chatter House around 9:30am for breakfast which is quite early if it’s a Sunday but trust me the sacrifice we made was worthed. We started out breakfast with Cappuccino to open up our eyes. What we Ordered was Spanish Omelette, Eggs Benedict, Scrambled Egg with Non Veg sides, Fresh Fruti Salad with Yogurt, Paneer Parantha, Pancakes and Waffles. 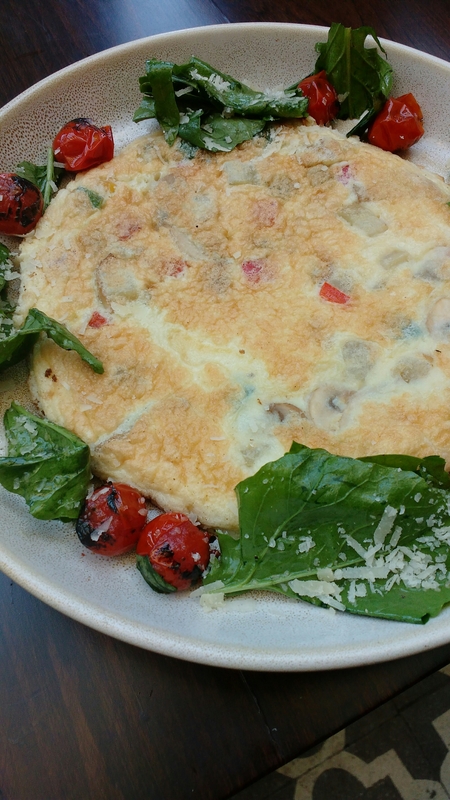 ☕ Spanish Omelette was a heavy omelette with Chorizo, Potatoes,Olives and Capsicum in it. Can be shared by two if you have ordered other things also. 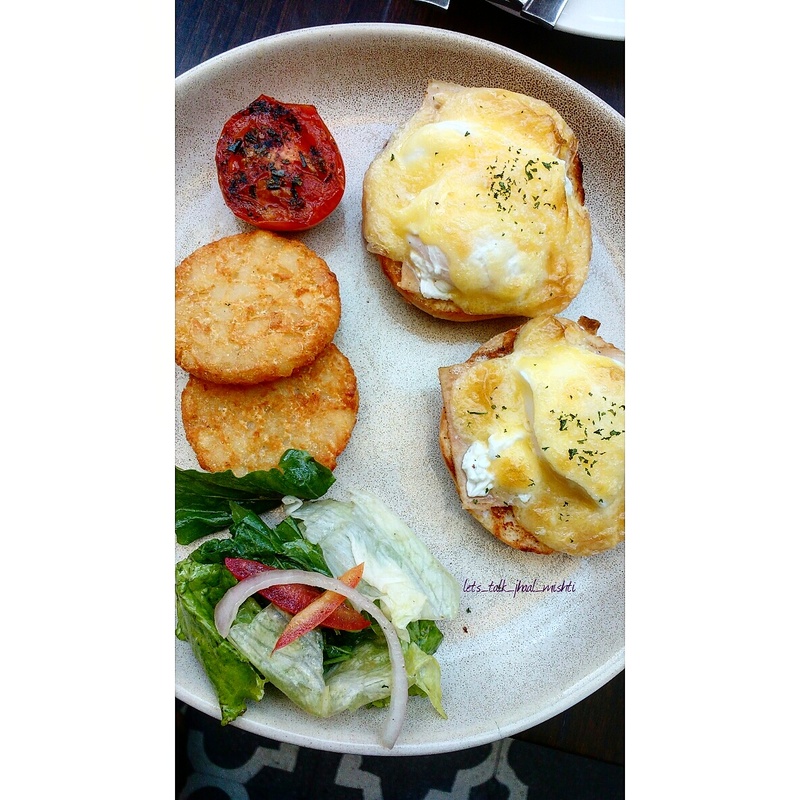 ☕ Egg Benedict one thing you must not miss here, was the bestest Egg Benedict i had so far. ☕ Scrambled Eggs were served with Sausages, Bacon, Hash brown and Smoked Tomatoes. Everything was delicious. 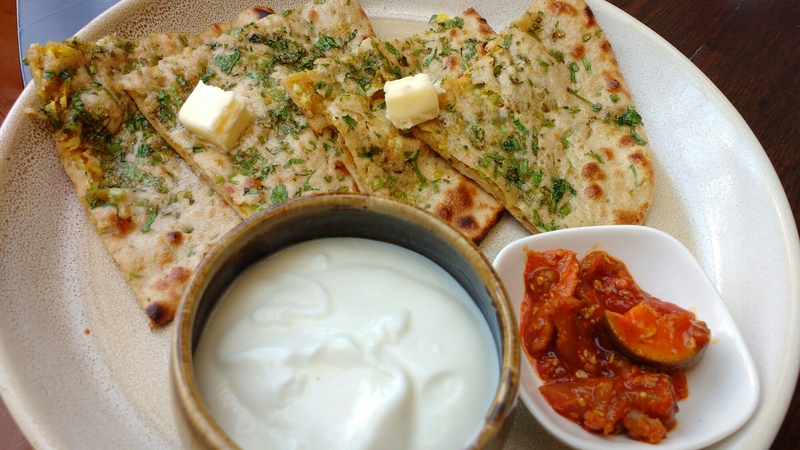 ☕ Paneer Parantha was something without which an Indian’s breakfast is incomplete. Tandoori Paranthas stuffed with Paneer and accompanied with Butter. Lip smacking good. ☕ Fresh Fruit Salad was served with Yogurt. The Platters had Papaya, Green Apple, Red Apple, Water Mellon and Cabernet Wine Grapes. 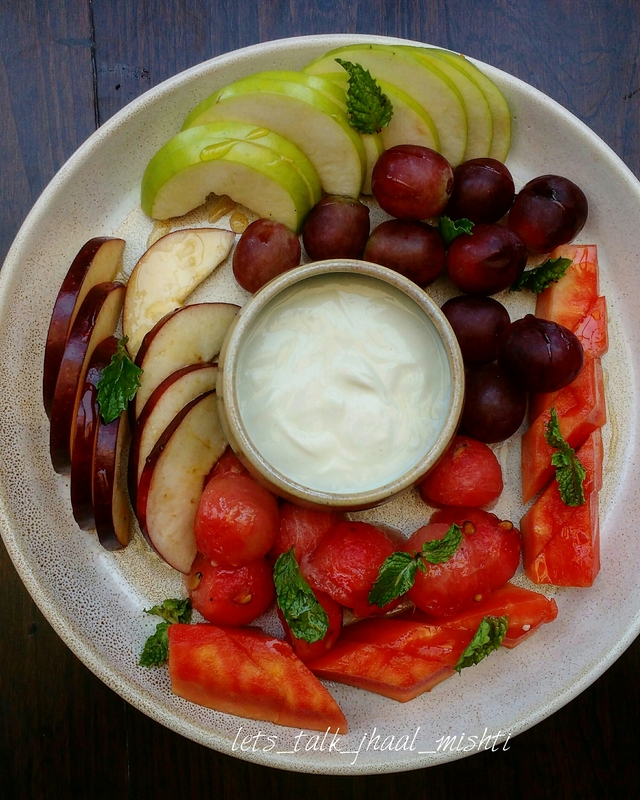 It was a colourful and a healthy Platter. ☕ Finally ended the meal with Waffles and Pancakes. 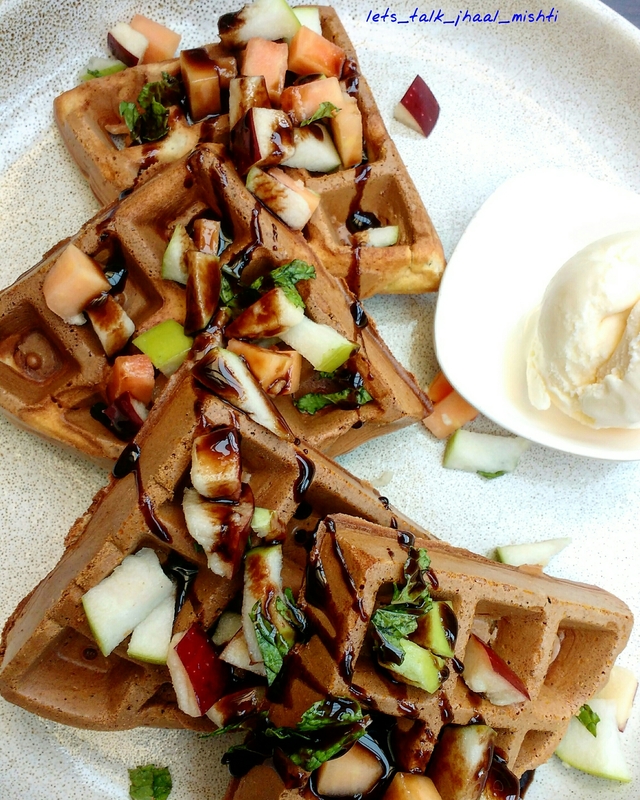 Perfectly made waffles are served with Maple/Chocolate Syrup and Fruit Compote. Pancakes served with Honey/Maple Syrup were equally good. The breakfast we had made our day, we were so stuffed that we had to skip lunch. 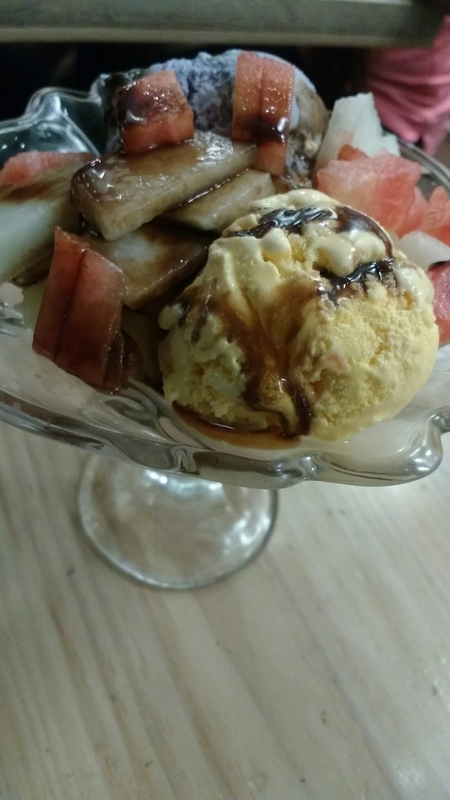 My experience with The Chatter House remains the same “Simply Wonderful”. Mehendi is know as the beginning of Big Fat Indian Weddings and to celebrate such beautiful occasion preparations are done months before this Ritual. Mehendi has its significance in Indian marriages, darker the colour of mehendi on bride’s hand deeper the love and the bonding with the groom. Friends, family and relatives gathers to take part in Mehendi Ceremony. 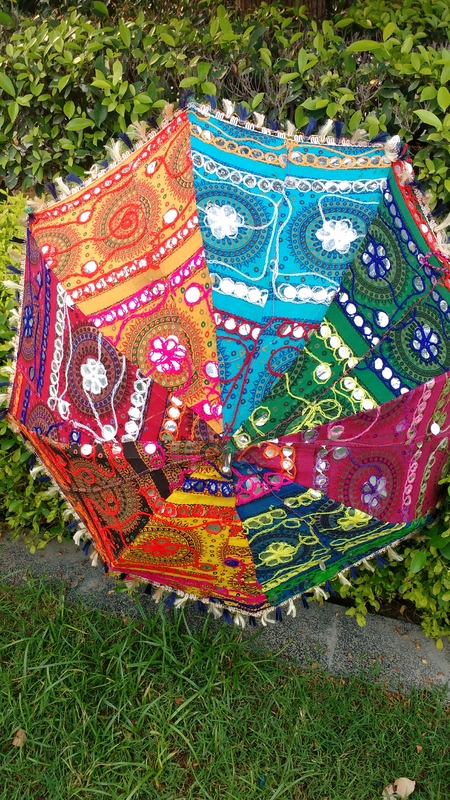 Traditional songs are sung on the best if Dholak and women dance the night away. Now such important function needs special attention to carry out the ritual smoothly. 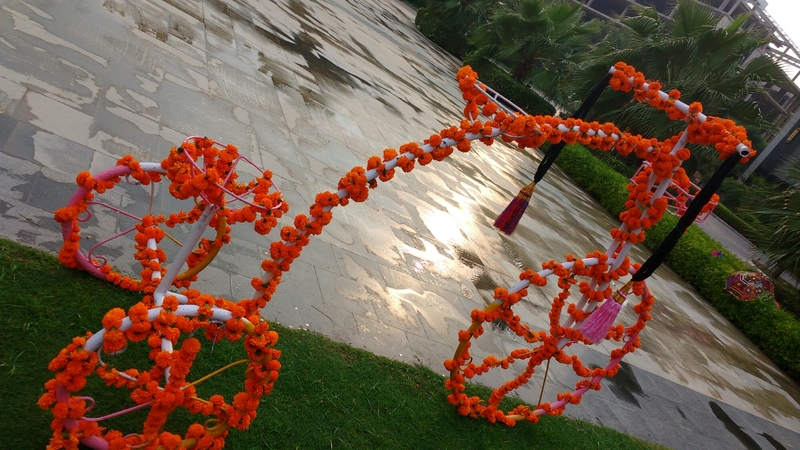 Recently Hyatt Regency organised a Mock Mehendi function to show Mehendi their way. Many renoned Bloggers, People from Print and Digital Media attended this wonderful event. The event reflected the hardwork and managing capabilities of Team Hyatt.Ms Simmi Sood who was taking care of that event spoke about the services and facilities offered by Hyatt for a smooth event. 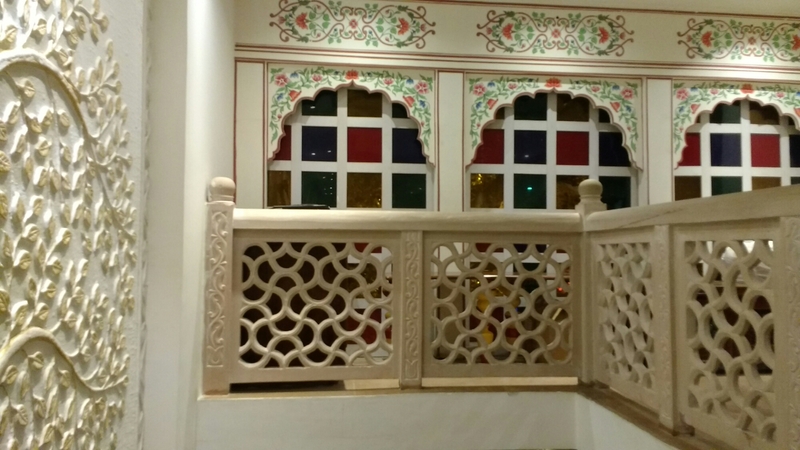 Marriage Planners, decorators, Caterers all are available. All u need is to choose, dress up and enjoy. However it was a Mock Mehendi Function but it was nowhere less than the real one. 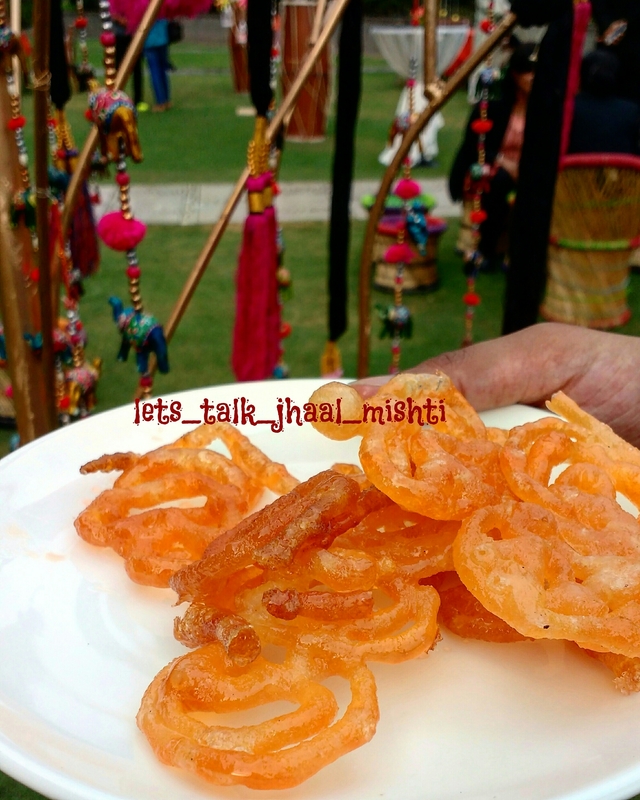 The decorations, flower arrangements, mehendi wala and lip smacking refreshments all was seen here. 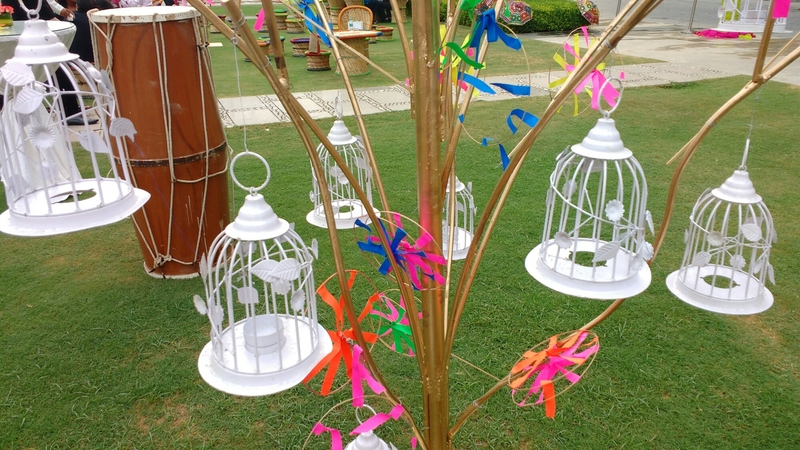 Various dance performance and not to miss a churiwala with glamour Bangels.The function was organised in the lawn area and ample space was used to create the magical ambiance. 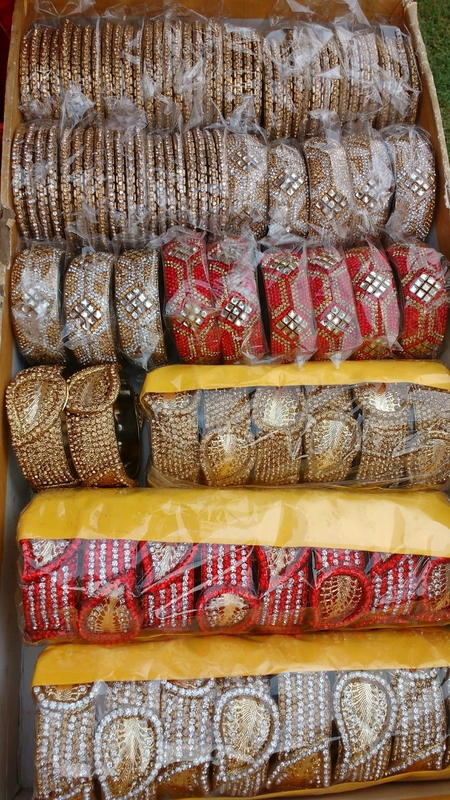 The event was a glamorous traditional affair. I must say for all your big fat wedding desires Hyatt is one stop destination. I m very sure you will have a memorable and a royal wedding to remember. 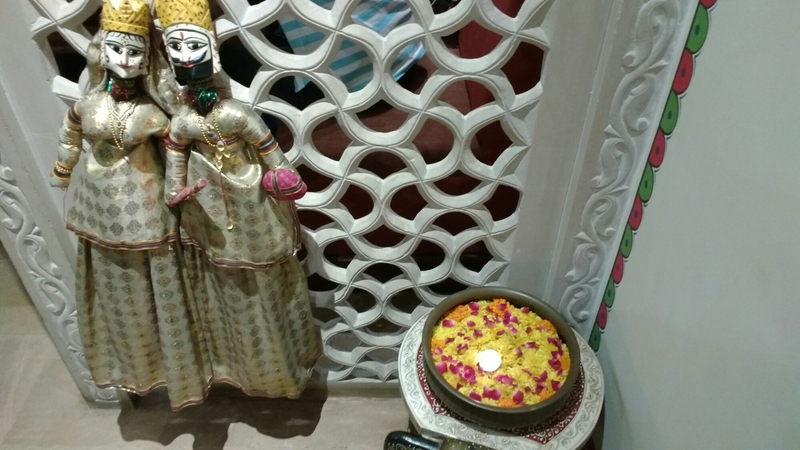 Kathputli has always been a saviour for me on Tuesday, Saturday, Navratra and For Vegetarian guests. Finally saying thanks to them by writing this Blog Post. 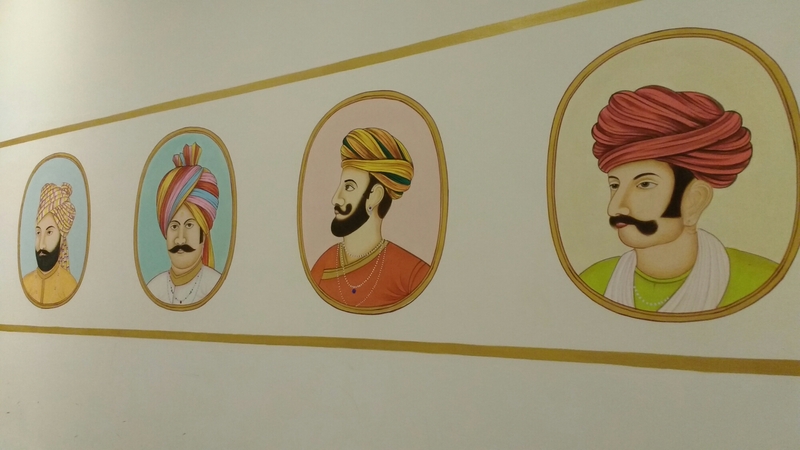 Kathputli a vegetarian restaurant and serving Rajasthani food is an attraction in Defence Colony Market. However Sagar Ratna is there but this place has its own unique charm. Honestly I don’t like to visit a vegetarian restaurant that has same threadbare flop menu. Many places claim to serve authentic Rajasthani Thali but leaving Dal Bati and Kair Sangri rest is normal North Indian thali menu. 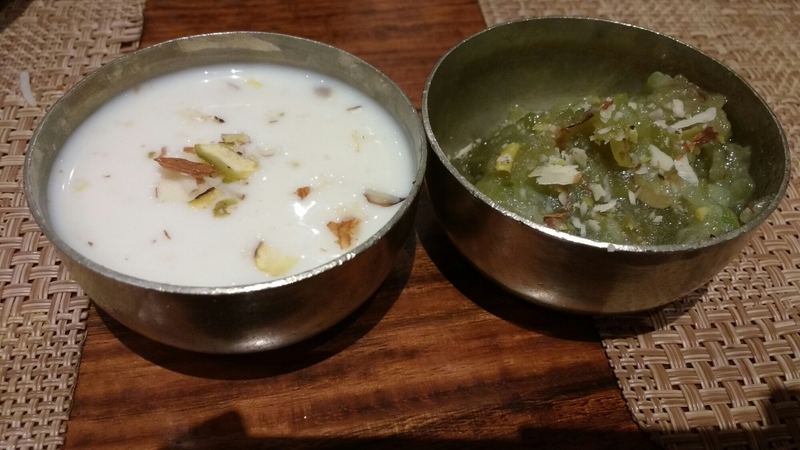 Here in Kathputli they say Rajasthani they serve the same. 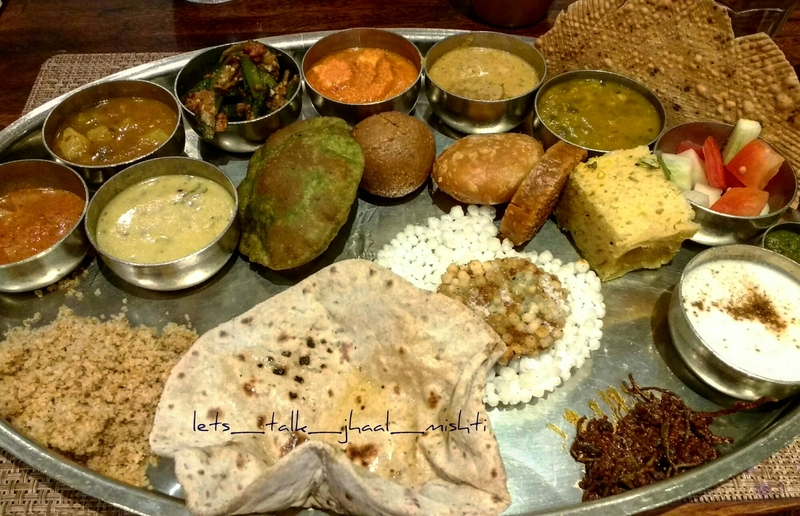 The thali has Khaman Dhokla, Kalmi Vada, Dal Kachodi, Mix Veg or Seasonal Veg, Alu Chatpata, Papad Sabji, Gatta Curry, Mirchi Kadi, Jodhpuri Dal, Bikaneri Parantha, Jaiselmeri Pulao, Mung Dal khichdi fewww….. ofcource Bati Churma and desserts. The list is a bit long and trust me at the end you will be stuffed. Chaach and Shikanji compliments the meal. They also serve Navratra Thali which has Kuttu Parantha, Singhara Puri, Samak Chawal, Fresh Fruits, Arbi Ki Sabji and much more. 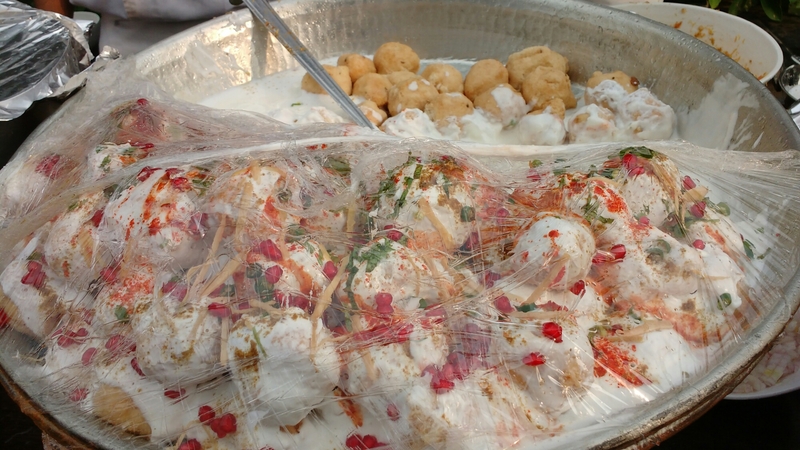 Unlike other paces even during fast you can have a Royal treat here. I have always loved the place and for their quality of food it ll remain my fav vegetarian restaurant. ​GTB Nagar is flooded with Cafés. Can say every fortnight a new café emerges out on this buzzing locality. With almost same menu, pricing and ambiance they all look same except their names. Visiting Cafeteria & CO was a sudden decision by my friend who spotted this café, Impressed with the façade and her craving for pizza dragged us to this place. The place was packed (even on 1st day of Navratra) so we had to wait for 5-8mts. 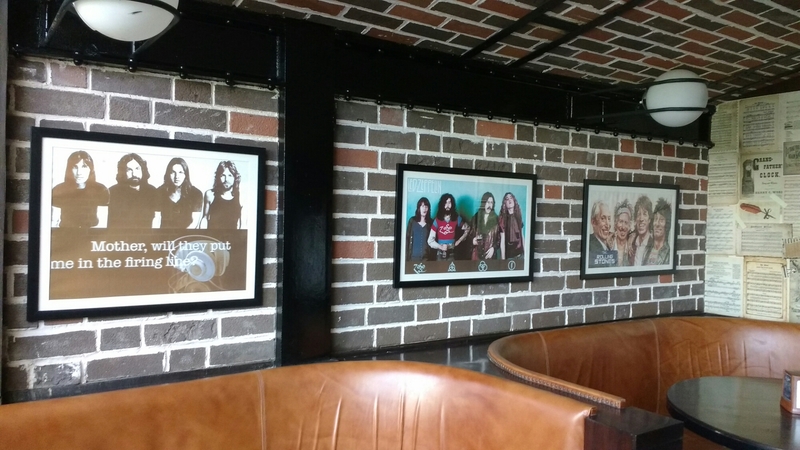 Three things I liked about ambiance of the place are quite spacious and big as compared to other café’s in the locality, see through kitchen and adequate lights. This is one place in GTB Nagar where I saw people from different age group. There were kids, college students and elderly people all together dining in the same hall which is a sign that the place is popular among all age groups. 🔷 Hand Wrapped Mozzarella Sticks: Apt for those who love Cheese. 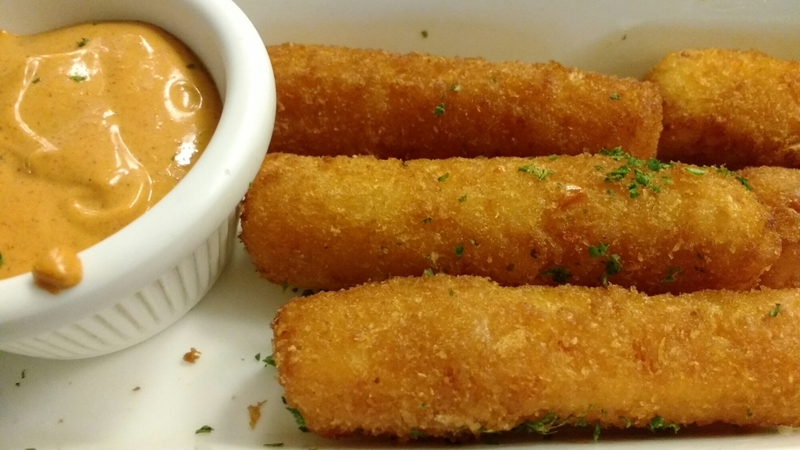 Crumb coated Mozzarella Sticks were Crispy outside and heavenly Cheesy inside. 🔷Cheese Jalapeño Bombs: Ok the name might give you a feeling of something Fiery but the flavours are more subtle. 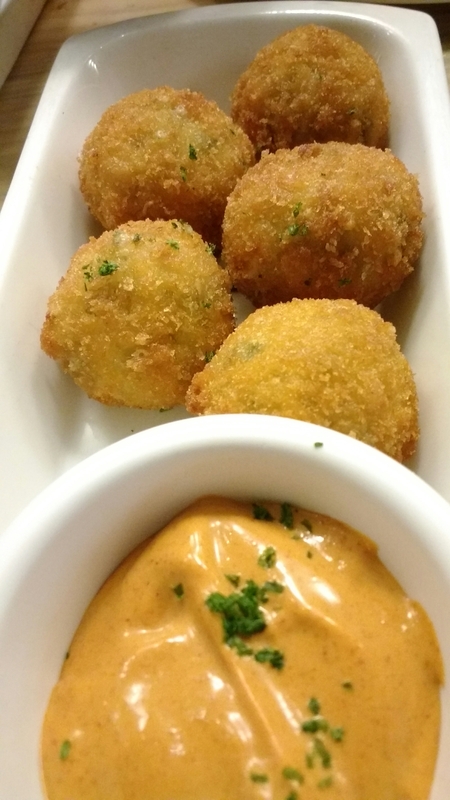 The Heat of Jalapeño is balanced by the Cheese in it, so don’t worry just pop a ball and enjoy the blast of flavours. 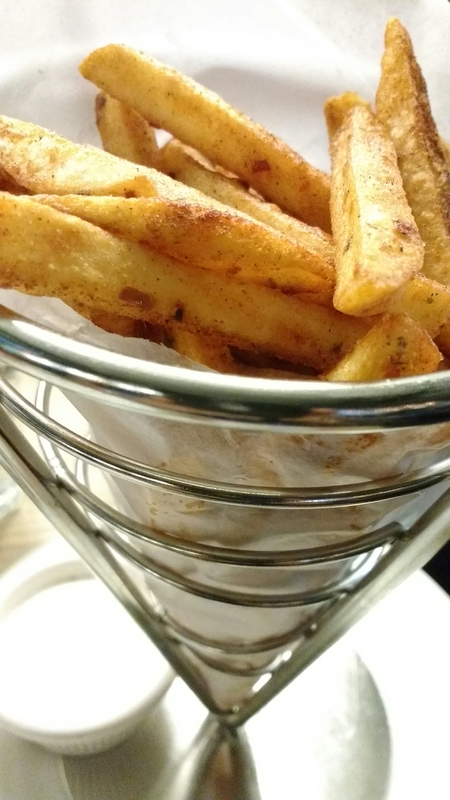 🔷 Seasoned Chicago Fries: A huge cone of spicy Fries and some dips to choose from. I opted for Garlic Parmesan. 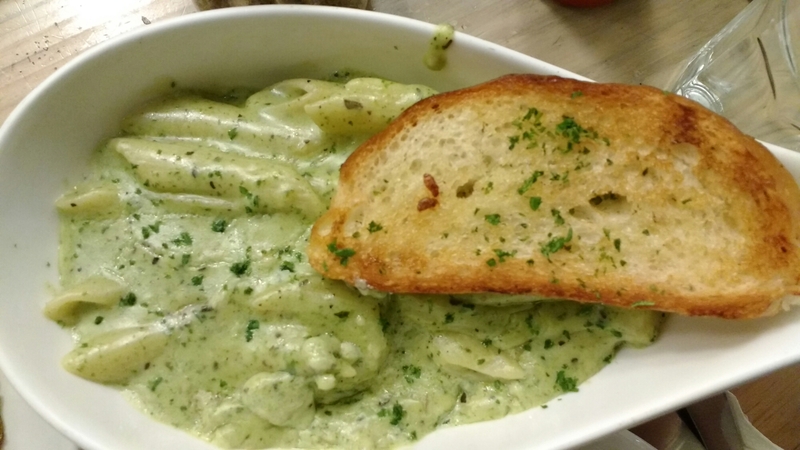 🔷 Penne In Pesto Sauce: One of the best Pasta I must say. Though it was modified a bit but I loved it. Adequate amount of Sauce with perfectly cooked pasta. 🔷 Pizza: We ordered Half n Half of Shrimp & Greek Chargrilled. 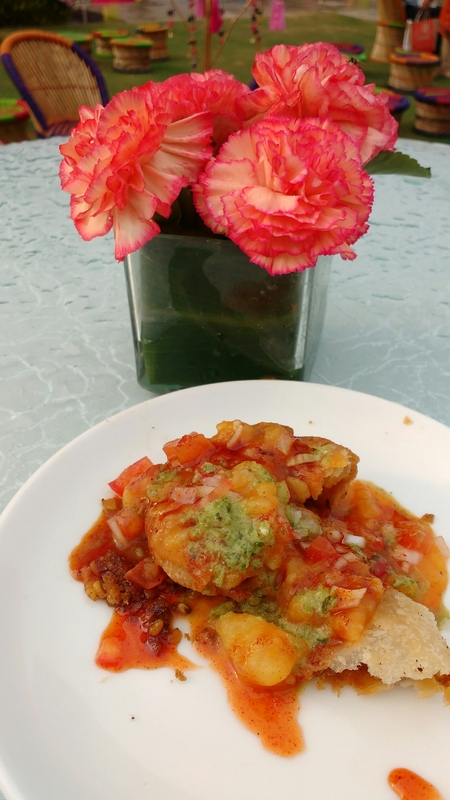 The shrimp was done in Lemon Butter Sauce and the Greek chargrilled was a combination of Onion, bell pepper, Tomatoes and Ricotta. A thin crust pizza made well. 🔷Tropical Fruit Sunday: I love my ice cream with fruits and this Sunday was what I love to have everyday. 3 scoops of Ice Cream Mango, Blackcurrant and Strawberry topped with fresh fruits. A strong recommendation. 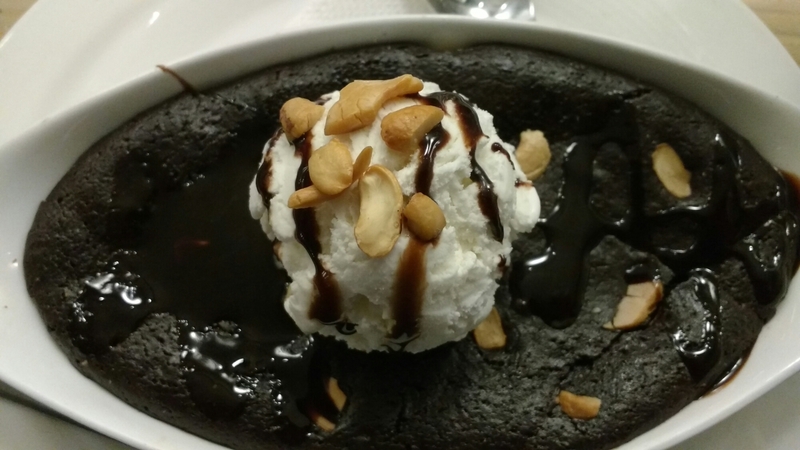 🔷 Chocolate Brownie with Ice Cream: The brownie was like Sticky toffee pudding and I loved it. Leave the ice cream aside I can have something like this any day. In a nutshell this is an absolute fantastic place. Come with your Friends or family I m sure you will enjoy your meal.